Charles Eastman, or Hakadah, as his Sioux relatives and fellow tribesmen knew him, as a full-blooded Indian boy learned the reticent manners and stoical ways of patience and bravery expected of every young warrior in the 1870's and 1880's. The hunts, games, and ceremonies of his native tribe were all he knew of life until his father, who had spent time with the white man, came to find him. 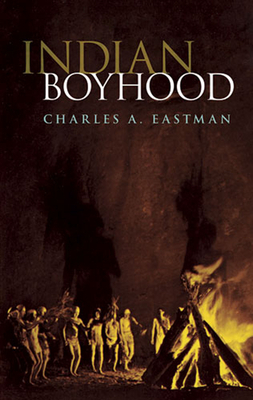 Indian Boyhood is Eastman's first-hand reminiscence of the life he led until he was fifteen with the nomadic Sioux. Left motherless at birth, he tells how his grandmother saved him from relatives who offered to care for him "until he died." It was that grandmother who sang him the traditional Indian lullabies which are meant to cultivate bravery in all male babies, who taught him not to cry at night (for fear of revealing the whereabouts of the Sioux camp to hostile tribes), and who first explained to him some of the skills he would need to survive as an adult in the wilds. Eastman remembers the uncle who taught him the skills of the hunt and the war-path, and how his day began at first light, when his uncle would startle him from sleep with a terrifying whoop, in response to which the young boy was expected to jump fully alert to his feet, and rush outside, bow in hand, returning the yell that had just awakened him. Yet all Indian life did not consist in training and discipline. In time of abundance and even in famine, Indian children had much time for sport and games of combat -- races, lacrosse, and wrestling were all familiar to Eastman and his childhood friends. Here too are observations about Indian character, social custom, and morality. Eastman describes the traditional arrangements by which the tribe governed itself -- its appointed police force, hunting and warrior scouts, and its tribal council, and how the tribe supported these officers with a kind of taxation. Eastman also includes family and tribal legends of adventure, bravery, and nature that he heard in the lodge of Smoky Day, the tribe historian. But Eastman's own memories of attacks by hostile tribes, flights from the white man's armies, and the dangers of the hunt rival the old legends in capturing a vision of life now long lost.